Make sure your pet is in a place where it feels comfortable, safe and protected. Use its bed, toys, blanket or crate to create a familiar environment and place it in a quiet area in your home. Basements are ideal as they buffer some of the sound and sights that can be scary to animals. If you don’t have a basement, be sure to close the curtains and try running a fan, white noise machine or soothing music to help drown out the booms and crackles. If you have a dog or cat that tends to bolt when frightened, confine your pet to a room where they have no access to the outdoors, (follow the first tip once there). An animal’s natural instinct is to run when scared so keeping Fido and Fluffy secure is paramount. Also, be sure your pet is wearing its pet ID or some form of collar and tag just in case of a mishap. Your pets will look to you for assurance and direction so remain calm and talk to them quietly while gently stroking their coat. Although, many will still exhibit signs of stress, your presence will go a long way in easing their fear. However, there is a fine line between soothing and making matters worse. 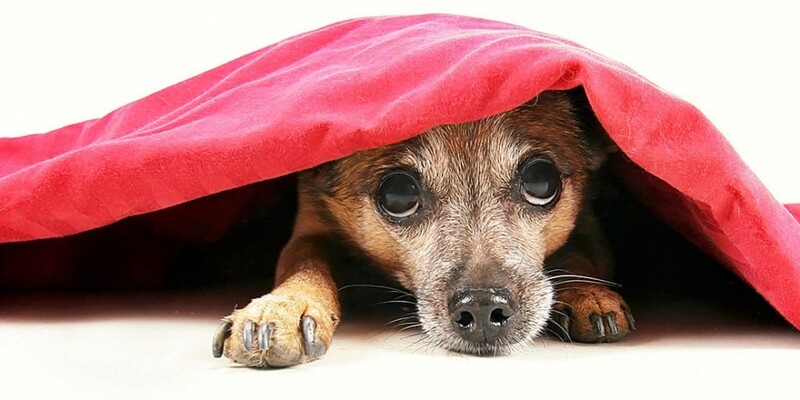 Try to limit the amount of coddling you give your pet during times of “irrational” fear. This can sometimes give the pet the indication that something is wrong, so by being indifferent to the loud noises can actually give your pet a sense of assurance. Dogs tend to pant when in distress so keep a water bowl in close proximity to prevent dehydration. Water can also be a calming effect for some animals; however when placing the bowl location, location, location will factor in. You want it to be accessible, but not in a “run zone” where it can be easily spilled or tripped over. Sedation should be considered the last resort but may be necessary in extreme cases. Some animals can cause harm to themselves when frightened so you may have no other choice than using a mild sedative. Ask your veterinarian what he or she recommends for extreme fear, then follow their directions. Other methods that have been proven effective are Thunder Shirts that give your dog a sense of comfort and security as well as Adapt Collars. This technological wonder collar releases pheromones that mimic a canine mother’s smell. Fireworks should be a time for fun not extreme fear and stress. Prepare your pets for the boom, whistles, and crackles to have a safe and patriotic 4th of July this year.